Sudden Oak Death is a tree disease caused by the fungus-like plant pathogen Phytophthora ramorum. First recognized in the mid 1990s, the disease kills some oak species (primarily coast live oak, Quercus agrifolia, and an oak relative, tanoak, Notholithocarpus densiflorus) and has had devastating effects on coastal forests in California and Oregon. 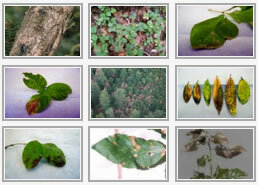 The pathogen also infects rhododendrons, camellias, and other common horticultural plants, causing ramorum blight. In the UK and Ireland, the pathogen is causing extensive damage on Japanese larch (Larix kaempferi) in plantations. Phytophthora ramorum was inadvertently introduced to California forests on nursery stock and, as an invasive species, is quarantined in over 60 countries with restrictions enforced on shipments of nursery stock and other host plant materials. For an introduction and background on Sudden Oak Death/P. ramorum read more here. Relatives of P. ramorum, other Phytophthora species are damaging native and ornamental vegetation throughout California. Unintentional pathogen introductions are an acute concern for restoration of sensitive habitat where restoration nursery stock may serve as a pathway for pathogen introduction into rare, threatened or endangered species habitat. Read more about other Phytophthora species found in native habitats, native plant nurseries, and restoration sites here. Help stop the spread of forest pests – including Sudden Oak Death – on firewood! Check out the website of the California Firewood Task Force. The California Oak Mortality Task Force is a task force under the California Forest Pest Council. Learn more about the Task Force, donate through PayPal, Like us on Facebook, and Recommend us on Google!